Water and bathrooms go hand in hand. Similar to kitchens, bathrooms see a lot of moisture throughout a regular day. Between showers, baths, toilet usage and sink usage, dampness is no stranger to your bathroom. If New Jersey homeowners are not careful, this can be problematic over time. Of course, bathroom moisture is very normal, and a bathroom should be constructed with certain building materials and in a certain way to take into account the intended usage for the space. However, excessive dampness over a period of time can leave you with widespread mold growth. It can be fairly quick and easy to prevent bathroom mold growth. It is all about bathroom moisture control is often simple and fairly inexpensive, you just need to know what to do, and you need to actually do it. Due to the purpose of a bathroom, the space will see a lot of moisture throughout the day. In order to prevent bathroom mold growth, it is important for South Jersey homeowners to pay attention and prevent excess moisture buildup. Otherwise, you could be creating the perfect breeding ground for a serious mold problem. Check for leaks by assessing for and feeling for dampness around your bathroom pipes and seals. Excessive water intrusion can lead to serious water damage and major mold development. If you discover a bathroom leak, be sure to call a professional (i.e: a plumber or handyman) to address the issue right away. Unresolved leaks can turn from a minor problem to serious and expensive issue. In the event of a major water leak or bathroom flood, you may need to contact a professional water damage restoration company to properly extract the water and dry out your bathroom. If you are experiencing slow draining in your sink, bathtub or shower, it can be an indication of a backup within the drainage system. Clogged drains can lead to mold development. Clear up the drains immediately. If you are experiencing persistent backups, it can be symptoms of underlying sewage system problems. Unaddressed sewage system problems will only grow to be worse, so take the time to assess your property for symptoms of a NJ sewage leak or clog. The top threat to your bathroom is humidity. Indoor humidity levels above 50% can leave your bathroom vulnerable to mold growth. Keeping your bathroom humidity below 50% can be key to preventing indoor mold growth. Between hot showers and the constantly running water throughout the day. Humidity levels can skyrocket if you do not take the necessary precautions. Check your bathroom exhaust fan to make sure it has sufficient pull so it can effectively pull the hot, damp air out of the bathroom and away from the home. When using the shower, keep doors closed to keep the hot, damp air from escaping and affecting dry areas of the home. Make sure that all your surfaces are dry when possible and within reason. Wipe and dry surfaces like mirrors, tiles, glass and walls as needed. Excess standing water can create problems over time. Water from damp surfaces can evaporate, put more water vapors in the air, and cause the indoor humidity to rise. Repeat exposure and prolonged exposure to water can affect your porous building materials as well. Remove unnecessary items to reduce the amount of wet surfaces that could support mold growth. We often ignore unused items. If items are sitting in moisture, mold can develop underneath the items and spread without notice. 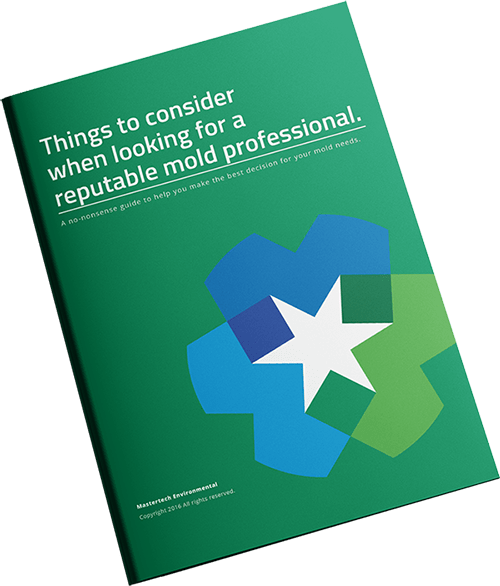 Mold loves to feed on dead organic matter: dirt, dust, hair, body oils, urine, feces, etc. Keeping your bathroom clean will help to keep mold at bay. Make it a routine to wipe down all surfaces with a mild detergent, a baking soda solution, or a vinegar solution. This includes walls, floors, counters, shower stalls, bathtubs, toilets, etc. Make it a habit to wash all porous items. Porous items like rugs, towels, etc, hold moisture that can trap mold spores. While it does not take much to prevent bathroom mold growth, some major water events (like leaks and flood) are inevitable. If you think you might have a serious mold problem developing in the bathroom of your South Jersey home, contact the bathroom mold remediation team at Mastertech Environmental.